Good Friday leaves us in the tomb with our Savior, Jesus. Mary's anointing Jesus' feet points towards God's lavish love for us. How do we handle what God has rolled away? God’s grace meets Moses and the fig tree. Jesus rejects the mortal threat of Herod and points towards Jerusalem. The First Sunday in Lent always returns to the story of Jesus' temptations in the wilderness. Loving our neighbors is hard. Loving our enemies is harder. Maybe they are the same thing. The heart of Jesus teachings' invites us to ask, what will truly nourish me into life? Jesus dares us to throw our nets into the water again, and be changed forever. Musical and reflection highlights from the Memorial Service for Dr. Daniel Hoggatt, music director emeritus at Church of Our Saviour. God's promise knits together a new kind of community. The miracle of the wedding in Cana is so much more than merely a demonstration of divine power. Through fire and water we are called, but not to be punished, but because we are beloved. Late into Christmastide, John offers us a whole new universe to consider. As we our busy in Advent, we come face-to-face with the heart of Jesus' teachings. The end of the Church Year signals the beginning of the New. In the midst of distress and difficult times, the Spirit offers us joy. The story of the widow's mite demands a revisit. Bartimaeus offers us insight into what a faithful life is all about. As we grapple with ancient questions of suffering and human agency, we find the door open to the kingdom. Jesus confronts us with a powerful choice over what we give our attention to. Learning to live in a world that consists of more than our senses. Jesus offers a path through our brokenness that appears to all the world utterly futile. The Syrophoenician woman challenges Jesus, and the whole faith changes. Jesus spars with the religious authorities and our tendency to make God's love transactional. We will always be consuming something. Jesus invites us, shockingly, to consume him. When we find that God's dream is radically different from the world's. Our invitation to reconcile all things. Observing holy boundaries is a key part of the walk of faith. The Spirit's arrival means that the Church will always be unconventional. Christ sees us and embraces us with a mothering intimacy that draws us heavenward. Part of the Easter miracle is found in the miraculous transformation of Jesus' first followers. Thomas shows us how doubt is a part of faith. Like the first women at the tomb, we are startled at what we fail to find. The Passion story continues to shock and bewilder us. Jesus shows us the commandment, complexity, and heartbreak of true hospitality. While the Church has focused a great deal on theological meaning, Jesus' life is given as an example. Taking up our cross means putting down worldly power. Mark delivers the simplest description of what it means to follow in the path of Jesus. Are we observers in the Transfiguration or participants? How do we recognize God's authority at work in our lives? Ninevah and the first disciples share one thing in common: the time for new life is now. Overcoming our fear of future death by stepping into the eternity of the present. We have two Christmas stories. Are they compatible? Francis helped us see the whole of salvation in the Christmas story. As Mark cuts immediately to the chase, John the Baptist sounds the alarm. When it comes to Advent, preparing is easier for us than waiting. What does it mean when Christians accommodate the Gospel to empire? Like many of Jesus' teachings, the parable of the talents is not as simple as it might seem. From a savior who might show up at the darkest hour, we are called to keep awake. Art and architecture introduce us to the lives of the saints. The love that Jesus invites us into and to practice is radical, subversive, and dangerous. One way of understanding hypocrisy is as a sub-crisis, a distraction from the true matter before us. What if Jesus is the man without a wedding garment? Confronting the violence of the world with a radical parable. The piety of St. Francis is much more than a notion of personal holiness. A tribute to Marilyn Campbell, a mystic among us. Jesus offers a harsh parable, reminding us of our call to forgive. Salvation is not just about accepting Christ personally, but embracing love in community. What happens when the Prosperity Gospel fails us? Our response to our call to ministry echoes in eternity. The Canaanite woman reflects to us the call of faith. How is Jesus calling us to step out of the boat and into the stormy sea with him? Our calling is not to great acts, but to small acts of kindness and mercy. Jacob shows us that in our own dreams, we can learn God's dreams for us. How much is enough? How much am I willing to give up to follow Jesus? What is life in the Trinity like? Ascension remains one of the trickiest Christian Feasts to explain. Like the Athenians, we are invited to receive a God already closer to us than we can imagine. A critical way towards balanced in a most unbalanced age. The resurrected Christ is with us in the road of life. Mary Magdalene grasps the Easter vision, and we are never the same again. When we are caught in the ironies of this life. When we meet death, faith, hope, and love become choices much more than feelings. Are we the man born blind? Learning to see the woman at the well through Jesus' eyes. Members of Church of Our Saviour reflect on the story of Nicodemus. The temptations in the wilderness are forever the pattern of our temptations. A variety of voices read scripture and reflect on the meaning of Ash Wednesday and Lent. When nature calls more strongly than the Church. Jesus' call to love our enemies is profoundly political, not just profoundly difficult. When it comes to bargaining with God, what do we really have to bargain with? Reckoning with a God revealed by failure, not success. When Jesus calls, we risk a radical transformation. Jesus poses a critical question to his first followers. What are you looking for? God's radical love for us disclosed in Jesus' baptism. The Christ child meets our power politics. The ancient tradition tells us that Jesus is born not because we are ready, but because God is. A homily at the memorial service of Peggy Redfield. Advent is not a preparation for the holidays, but a time to look within. Attending to the Advent call to be awake, watchful, and ever vigilant for grace. Christ the King sends us back to our call to stand with those Jesus deemed "the least of these." Jesus foretells the destruction of all of our sacred temples to make way for the true Temple of God. The center of Jesus' teachings is addressed to a world of power, and then to the saints in love. Forgiveness is born of love, a daily and even hourly practice of opening our hearts to one another. In a world where we are driven to conversation and action, we must remember to listen. Jacob epitomizes the most critical struggle of our lives. How do we over come our over-riding sense of entitlement? Francis of Assisi teaches us to value a spirituality held by indigenous peoples. What does Jesus mean by calling us to become shrewd? Is God immutable or evolving with us? Jesus' wisdom is anything but conventional. Prophecy: an impossible vocation for anxious times. How do we make sense of a God who takes pleasure in giving to us without expectation? Learning to connect our life of faith with justice. Church of Our Saviour celebrate ten years of ministry with their Rector. The parable of the Good Samaritan may be less comforting than we thought. We often regard hope as a Christian virtue, but it may well be more than just that. We, too, receive the mantle of the prophets. Seeing ourselves in the Gerasene demoniac. The woman who honors Jesus with her tears confronts the ancient system of sacrifice. Jesus and the Centurion in Capernaum reveal what happens when we yield authority to God. The disciples did not wake up the morning of Pentecost expecting the Spirit's arrival. How far will God's love go? Is Jesus the Good Shepherd in the pattern of Solomon or the prophets? Paul and Peter witness to the power of conversion, a central movement of our faith. Doubting Thomas gets a bad rap, but his may be the truest faith of all. Why do we look for Easter among the death-dealing ways of the world? Peter's objection to Jesus' washing his feet is only human. Palm Sunday opens the revelation of God's Way, which is so unlike ours. How do we show our love for Jesus? What will it take for us to throw off the yoke of Pharaoh? The Pharisees are Jesus' friends when it comes to Herod. . .or are they? Is the confrontation in the wilderness just Christ's, or ours, too? When the Good News sounds like bad news. Scripture is only fully comprehended in a community gathered around God. How does Jesus change water into wine? Have you ever considered your baptism a political event? The prologue of John's Gospel discloses the divine logic at work in Christ. In our busy Christmas preparations, do we easily forget what the season is about? John the Baptist's call for repentance is nothing less than a call to embrace true freedom. Facing what feel like the end times, we are called to be open to a God who makes all things new. When the world is confronted by Christ. . .
Jesus' apocalyptic vision in the face of terrorist attacks in Paris. The poor widows of Zarephath and the Temple treasury are prophets in their own right. In our darkest hour, we are promised nothing less than God's abiding presence. A thread running deep in the Judeo-Christian tradition. The dark night of the soul confronts all of us, but how does God respond? Francis exhibits a faith so radically simple that the world cannot help be transformed. Esther's witness is about fidelity in the face of daunting odds. The call of wisdom confronts our world of agendas and soundbytes. The call to "be opened" is central to the Gospel of Jesus Christ. Having taking in the Bread of Life, how do we share it with the wider world? At the heart of the sacramental tradition is a scandal, a stumbling block. Jesus' insistance on identifying our faith with bread and eating calls us to an embodied life with him. We all imitate someone, so Christianity is about imitating God in Christ. The call of the sacramental life draws us beyond our own desires and needs. On the call of Jesus and mission trips to build housing in Taos, New Mexico. In Nazareth, Jesus learns that his transformation only bewilders his hometown. Learning again to be disciples in the boat with Jesus. Jesus' metaphors for the Kingdom of God almost invariably involve small things. Ramah, Samuel's birthplace, becomes a symbol of high spiritual places. One gift of the doctrine of the Trinity is that it builds paradox into the heart of our tradition. The spirit of our loved ones remain a part of us, as does the Spirit of God. God's grace amid the ordinary institutional life of the Church. Christ invites us to be part of the vine, pruned, shaped, and nourished in relationship with one another and God. Thomas shows us an alternative to both fundamentalism and reactionary atheism. What draws the women to a sealed tomb? The Cross of Christ represents to us much more than the death of Jesus. Encountering a God who serves is a fundamental scandal. Jeremiah discloses the difficult journey to joy, and God's constancy. Jesus offers signs that unseat our deepest attachments. The youth of Church of Our Saviour reflect on Lenten practices. The Messiah we want. . .or not. Jesus' promise of the kingdom come near seems so fragile, but it has always been. The call of Jesus on Ash Wednesday is to live into paradox. Bearing witness to what true religion means. Remembering our own exile is a pathway to compassion. What if liberty is authority in a different guise? A firsthand account of being homeless and the challenges it brings to being in community. Pondering the call from an old way of thinking about mercy to a new one. Looking at Samuel, Nathanael, and Martin Luther King, Jr.
Mark calls us to see Jesus' baptism, and ours, and nothing short of a new creation. Jesus as God's embodied promise for the world. Jesus' birth reveals a God we didn't expect. In the midst of the darkest days, we receive a most unexpected command. Until we stop thinking we know what we are doing, we cannot find the path of repentance. Christ's Advent at the center of our shared wounds as a people. Neither a fire-and-brimstone God nor a cosmic ATM will do when it comes to the God we need. Jesus, Paul, and Amos all call us out of our complacency. Zilpha Keatley Snyder was a legendary author of fantasy and fiction for young people. All Saints' and All Souls' bring us into that thin place where the dead and living touch. Jesus answers an ancient riddle in a new way. When confronted about his own authority, Jesus points back to the people. At first glance, the kingdom Jesus promises is anything but fair. The prophetic tradition holds as true today as it did over two-and-a-half millennia ago. . . The powerful have always asserted their identity and authority, but Jesus approaches things quite differently. The Canaanite woman confronts Jesus with the primacy of his own teaching. Jesus' vision of the kingdom is more than just relieving hunger. Isaiah, Jesus, and Paul all urge us to hope in the face of evil. Our struggle to become good soil for the Gospel is about our struggle to be vulnerable. Jesus' easier yoke, revealed to infants. . . Starting on the ancient spiritual path of purgation, illumination, and union. The Trinity's unity and diversity reflected in the very fabric of the universe. . . The arrival of the Spirit overturns the scattering of Babel, and reveals our identity. Easter gives us the strength to confront real evil. Paul's speech to the Athenians speaks to us. Jesus as the Way, even down to our every breath. Jesus the good shepherd says "I AM the gate," but what does he mean? Easter does not fit with business-as-usual. On Maundy Thursday, we remember how God has brought us out of Egypt. The man born blind in John's gospel offers us an example of faithful humility. Jesus discloses the bonds of divine love for all humanity when he meets the woman at the well. Nicodemus, the early Church in Rome, and Abram all ask, in their own way, if there is more. Adam and Eve contrasted with Jesus -- the new Adam -- in the wilderness. Truly, those who are acting to fit in have received their reward. The children and youth of Church of Our Saviour talk about transfiguration. Meeting the transfigured Christ prepares us for Lent. Jesus calls us to confront a world of violence with a radical subversion. God confronts us with the fundamental choice between life and death. Jesus and Isaiah confront the sin of religiosity. The Feast of the Presentation reminds us of two distinct perspectives on the body in Christianity. Do Jesus' first followers even imagine what they are getting into? Water as the symbol, location, and vehicle of God's salvation. The wise men from the East stoke our imaginations and show us a path to welcoming Christ. Only when we confront our own history and identity are we prepared to meet the light of Christ born in our midst. While we talk about the Word, we often miss the critical silence into which God is born. The stress of the season meets the promise of God's coming. When John the Baptist collides with Isaiah's peaceable kingdom. Practice makes perfect? On keeping awake. . . The dangers and hopes of remembering that Christ is King, that Jesus is Lord. Highlights of Porter I. Leach's memorial service. Job's faith and Jesus' clear vision of the resurrected life. Are we prepared to believe that God loves us even in the midst of our exile? An opportunity before the Great Gulf is fixed. . . The parable of the dishonest manager challenges us to remember that wealth and relationships are closely intertwined. Jesus appears to take a pessimistic view when it comes to our repentance. Are his expectations too low? The Trinity calls us into a celebration of life itself, the dance of all creation. The Holy Spirit acts at such a foundational place in our lives, we can sometimes barely notice its work. The bare threads of faith are brought together into a tapestry that witnesses to God's love at work in our midst. The truth is, all religious enterprise, and the Christian faith in particular, hangs much of the time by the barest of threads. The love to which Jesus calls us is fundamentally subversive and transformative. Tragedy reminds us of the way we are called to shepherd one another in Christ. Thomas shows us that belief in resurrection involves much more than we might think. At Easter, the Risen Christ goes on ahead of us to open the way of an Easter life. From Genesis to John Chrysostom: Church of Our Saviour embraces Easter. One call of Good Friday is to choose what we will leave at the foot of the cross. The Last Supper/Communion brings us into the loving fellowship with Jesus. Mary of Bethany gives us a profound example of the love we are to have for Christ. The Parable of the Prodigal Son reveals just how radical God's love for us is. Repentance in Lent means following a call to return to the deepest self. 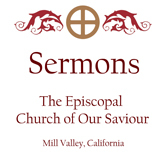 Eulogy and homily from the memorial service for Janet Willis Upham. A homily for the memorial service of Marjorie Norton Cope. When it comes to temptation, there is one basic thing never to lose sight of. . .
Planning for Lenten spiritual disciplines can often defeat the purpose. Jesus' transfiguration reminds us of the glory promised to each of us, and a God who leads us through the darkness. When Jesus goes home, he encounters a familiar problem that is. . .well. . .familiar. It is in the accidents of life that we often where we first encounter true community and then ourselves. Jesus is born into the darkest places of our hearts. Apocalypse simply and literally means an "uncovering," a revelation. Small miracles make up the tapestry of God's redemption. The message of repentance comes from a most unexpected place. In the midst of the exile experience, God's promise to draw us into new life remains. Belonging to a kingdom "not from this world." The Church is so much more than bricks and mortar. Naomi teaches us about God's wonder-working through the darkest times. Cutting through all social and theological differences, Jesus asks a simple question. Job poses to us an ancient riddle that leads us deeper into a life of faith. Does competing with one another make us become who we truly are? Among our greatest spiritual challenges: proclaiming Jesus as Messiah. To take pride in what we are expected to do is false pride. Learning again what it means to be truly religious. How do we think of ourselves as a Christian people? Story in Jesus' hands turns our world upside down. True wholeness entails an acceptance of brokenness. What we think about God matters less than how God is part of our story. Jesus' handling of power is very different from the world's ways. Our youth talk about their mission trip to Taos. The Gospel tells us over and over again that emptiness makes room for faith. Among our great spiritual challenges is to radically accept the storms of our lives. The empty tomb points us to the surprises of God's grace in our midst. The Israelites want a king, and Jesus' miracles get him branded as crazy. Is God good enough? Listening and living into the Spirit moves us in unexpected ways. Keeping God's word changes us in more ways than we can imagine. The spiritual life is learning to live the paradox of both being on journey and abiding. Transitions make room for the Spirit. Easter calls us not simply to relationship, but utter and complete dependence on God. We listen for the voice of the Good Shepherd, but might we also express that voice for one another? As witnesses, we are not merely passive observers, nor consumers of God's truth. . .
One thing that the Risen Christ offers that the world cannot. . . The Passion reveals Jesus as undeniably human. Jesus washes his disciples' feet, honoring their last night together. Haiti calls us to action in partnership with God's grace. Of serpents, Jesus, and Nicodemus. Desperation is often the beginning of the spiritual life. Amongst the most powerful words in our spiritual vocabulary is No. Lent as springtime for our spiritual journeys. What happens when our institutions come right up against our mission? If loving our neighbor is hard, loving our enemy is even harder. A life of prayer is not built on perfection, but humility. Love and accountability are inexorably intertwined in God's grace. To answer the call of Jesus is to radically upend our lives forever. God loves us first, last, and always. When fragile love is shocked by the ways of the world, what do we do? Christmas reveals a wild God offering us a wild love. Preparing for Advent means setting aside some busy-ness for God. Are we keeping awake for the right thing? On being a sheep in Christ's kingdom. Thiefs in the night, a spiritual weather forecast, and stark warnings confront us. Saints do not create themselves. Instead, they live into what God made them to be. How do we respond to the grace we have been given? Jesus challenges our notions of fairness with kingdom economics. The tenth anniversary of 9/11 collides with a gospel passage on forgiveness. When looking at our journey towards Jerusalem, it's easy at first to lose trust that Christ will see us through. Does Jesus' title of Messiah domesticate him? The Canaanite woman teaches Jesus' followers about faith. Peter's lack of faith reflects our lack of faith. . .in what God has already given us. Jesus speaks to the spiritual failings behind our governmental ineptitude. Matthew piles on Jesus' parables to fill us with the Gospel. The parable of the wheat and the weeds. Grace is sown with abandon. . .and divine hope. Jesus can't win for losing. . .or perhaps he can. The mystery of the Trinity drives out of safety and certainty, and into a dynamic relationship with our God. The wind that changes the landscape of everything. Jesus promises us an Advocate who will be with us forever. The Rapture and the Way, the Truth, and the Life. Our mothers often were the first to disclose Christ to us. The Risen Christ has a question. The story of Lazarus reveals our call in engaging broken hearts. Jesus sees the Samaritan woman and us completely. What would it mean to stop holding our faith at arm's length? We are driven, like Jesus, into the wilderness to confront our most basic selves. Of all that clamors for our attention, it is God's call to us that gives us life. Checking out of relationships of violence. Grace is radically free, but also radically demanding. "Blessed are the poor in spirit. . ." says Jesus. Jesus calls us into a life of discipleship. Baptism is about God's call to our roots, of recognizing we are beloved of God. A 12-year-old Jesus teaches us to value relationship and understanding rather than fear. Learning to follow the star beyond the holidays. Jesus in the manger vs. "God does not exist." Highlights from the Lessons and Carols Service 2010. Betsy Rosen's diaconal farewell sermon at Church of Our Saviour. The call to bear fruit worthy of repentance. Does it make sense to call Christ a King? The Kingdom of God unfolds in unexpected ways. Zacchaeus teaches us about vocation in God. What the Pharisee and the tax collector teach us. Praying on the uphill climb. On becoming an ordained deacon. Exploring the spirituality of suffering. Our God takes pleasure in giving. A challenge to challenge God. Welcoming God in the stranger. What do we mean by "God Bless America?" Jesus shocks us into the life of the Gospel. How God responds to our fear. A contemporary version of an ancient heresy? God's family as ohana, through the life of Patricia Weissich. On why we have a Creed. The Tower of Babel and the Day of Pentecost. On living in Christian community. Reflecting on the faith of a "pillar of the church". Meeting God, being sheep, and figuring out what it means to be Christian. What do Christians mean by service? The first witness of the Resurrection tells us about our God. Good Friday comes again with news good and bad. Judas' perspective is often ours as well. Looking again at the parable of the prodigal son. Jesus gazes straight into fear. In the wilderness, Jesus faces the foundational temptations of us all. The Transfiguration reveals what a life of prayer means. The struggle to complain or give thanks. Think your baptism makes you certain? The Holy Family is not even above conflict. The incarnation story is our story for the life and light of the world. Is the Christ child an embarrassing truth? A small-town scandal reveals the truth of Christmas. A memorial for Pat de Fremery. John the Baptist: The Prophet who Stole Christmas? Do we prepare for Advent, or does Advent prepare us? On Channing Moore Williams and Missionaries. Taking on the "God of the gaps." Do we know how much to be thankful for? Is our understanding of prosperity God's, too? Revisiting the end of all things. Holiness is not found in being good or pious. EPIC Youth Rap about the saints. About apostles - Saints Simon and Jude. Jesus responds to the temptation to lord it over others. On Michael and All Angels. Obedience and the central symbol of our faith. Hyacinth Bucket and the Gospel. Lady Wisdom, our elder God. God's response to our desire to throw in the towel. The answer to life's hardest questions. Tough economic times and God's grace. What healing in Christ may truly mean. The faith that Christ commends. A memorial for Phyllis Grace Staton. When God calls us to grow up. A memorial for a remarkable curmudgeon. Creeds and doctrine get personal. The Spirit stirs up everything. When Christ calls us friends. A reflection on John 15:1-8. While the world whirls around us, we are called to abide. The practical implications of Easter. Finding freedom from perfectionism in the Resurrection. God chooses open hearts for the divine law. The healing power of the cross lifted high. Considering the place of disciplines in our lives. Jesus asks us a hard question. Healing is more than restoration. "Who's that sitting in my pew?" "For God alone my soul in silence waits." Faith is showing up, not being right. Water points back all the way to the beginning. In the incarnation, God is doing a new thing for all time. Christ is coming, whether or not we are ready. Advent is a time for being still. Wrestling with Church as Institution. An invitation to remember those most in need. God's sense of fair may not be ours. Seeing Creation as a source of spiritual wisdom. Learning to surrender in the face of tragedy. Thawing out a frozen faith. Defying gravity without being perfect. Jacob's wrestling with God is our wrestling with God. Pilgrimage teaches the hospitality of God's Kingdom. Are we called to weed our own field? Coming face-to-face with our obsession with things not of the Spirit. Does God desire sacrifice or mercy? Would Jesus recognize our most hallowed family institutions? How do we engage in the daunting task of dismantling racism? How do we join in the hope of the story of Lazarus? A God who meets the demands of our thirst, and exceeds them. Seeking God's transformative presence in our personal lives. The journey of the magi through their own eyes. The first step in bringing the light of the Christ Child to the world. The birth of Jesus proclaims God's transcendence over all claims of human power. Mary's conceiving a child is a lesson in God's power in the face of our own. What do we do when we recognize we are not prepared for the Messiah's coming? What is our role in the coming of the kingdom of heaven? God makes much out of very little, and little out of much. As Christians, we live forever on the edge of an imminent transformation of everything. Living into the promises of Christ the King. How do we speak to the apocalypse of our age? How does God redeem the mammon of unrighteousness? Are heaven and hell out there or right here? Sabbath as an essential spiritual practice in the "always on" culture. For a world burdened with many obsessions, Jesus comes to set people free. There are seven days in the week, so what does it mean to enter the eighth day? What kind of God does Jesus disclose when he teaches his followers how to pray? Harry Potter and Christianity -- friends or foes? Just how valuable is our work to God's grace? A Sermon honoring Barton Warren Shackelford. Our neighbors are in need. Will we pass them by? Are you a "Special Christian?" Think again. Baptism draws us into a new family where water runs thicker than blood. To know the story of a refugee is to know the story of Christ. On Christians called to feed all who are hungry. Liminal space opens us to the transformation of God's grace. Using Godly Play, Este Cantor describes the Trinity through the lens of baptism. Trinity is the path in which we come into closer relationship with God. Our sense of being powerful is forever confounded by God's grace. Jesus prays for unity amongst his followers, a desire that echoes to us across the centuries. Jesus is leaving. Our journey begins. Peter's journey reveals that the Risen Christ has overcome the boundaries of tribal tradition. Our call to care for the Earth is a holy one. Thomas raises questions that reflects the questions of faith for all of us. Resurrection, God, and being an Easter People. Excerpts from the 2007 Easter Vigil at Church of Our Saviour. Is the cross best explained by theory or reality? Jesus responds to a world of power by washing the disciples' feet. What does it mean that we call this Sunday Palm or Passion Sunday or both? The anointing woman is a figure long revered in religious tradition. The witness of Mary at the feet of Jesus invites out of a productivity-obsessed culture. In a beloved parable Jesus reveals a deep truth about God, and about how God expects us to live. A children's homily on the promise God makes to Abraham. In a world of threats from both without and within, God calls us into a life of trust. Jesus' wilderness reflects our own, where we are called to draw deep from the resources of our faith to respond to temptation. What expectations do we have to meet before we can witness the Transfigured Christ? Calls very rarely come out of the blue, but what happens when God in Christ walks right into the middle of our ordinary lives? How do we respond when God in Christ says or does the unexpected? The Prophet Amos speaks above the Arctic Circle. A Messianic parlor trick or a call to change the world? Water stands at the heart of our spirituality. . .but why? How far back does Jesus go? We may find the baby Jesus familiar, but he is a strange child indeed! The wonder of incarnation marks the beginning of our journey of salvation. The task of Advent was about getting ready, but few of us are! How is it that prophets always seem to hit us where we're most vulnerable? Our fractious age is rife with shutting out those who are different, yet John the Baptist calls us into a radical encounter. What do we mean when we call Jesus King of Kings? The terrifying words of Mark 13:14-23 offer reason to contemplate on how Jesus relates to apocalyptic imagery of the first century. In Mark 12:38-44, Jesus poses a challenging contrast between those who give out of their abundance and the widow who gives away everything, even the little she has. A conversation while waiting for jury duty gives rise to a reflection about atheism and the saints. Reflecting on Mark 10:46-52, spiritual blindness, and the numbing challenges that wartime brings. What do James and John in Mark 10, Japanese keigo, and a family of owls have in common? On Jesus and the rich man (Mark 10:17-31) and our relationship with wealth.